Sometimes it's hard to look at a certain genre and find it exciting. Zombie, slasher, post-apocalypse, vampires. Every once in a while, you think the dead horse is just getting beat. Perhaps one of the most exciting thrills for genre fans is searching for those films that can spin the genre on its head, introduce a new perspective, make it interesting. Well, Josh Mendoza is looking to do just that with his directorial debut of What Still Remains. In a near future, a virus has infected mankind and survivors are left fending for themselves. Sound familiar? Sure. These infected aren't the ravenous undead, though, but instead turn into feral coherent killers. That's cool in itself but Mendoza is mixing it up even more by throwing in a cult element, some moral ambiguity and, honestly, a little bit of feeling like The Last of Us. These are all good things. It's right around the corner, August 14th on VOD from Strike The Sun Entertainment, peep the trailer and poster below, coupled with the official press release! 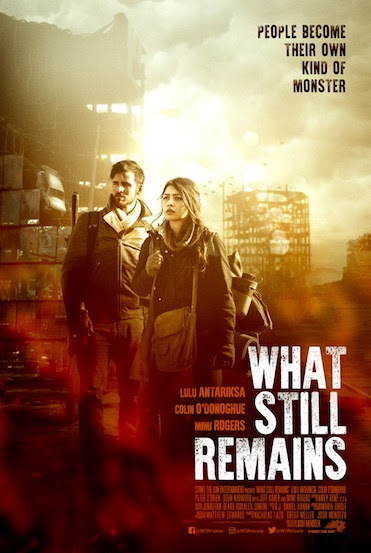 What Still Remains stars Lulu Antariksa (T@gged), Colin O'Donoghue (Once Upon a Time), Mimi Rogers (The X-Files), Dohn Norwood (Hell on Wheels), and Jeff Kober (The Walking Dead). It was written and directed by Josh Mendoza.